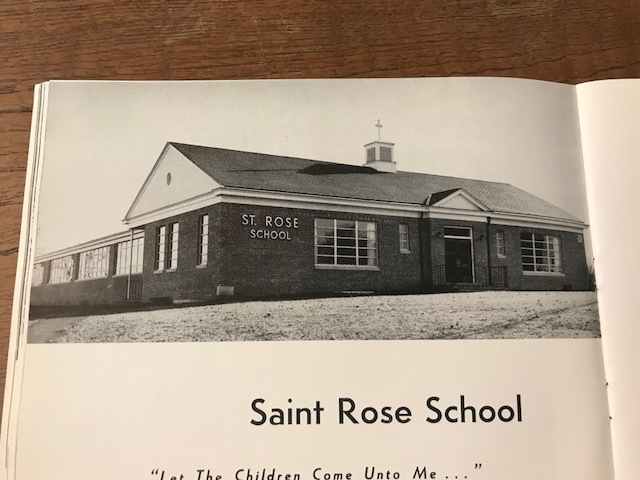 St. Rose School opened its doors on September 3, 1958 under the direction of Pastor Reverend Walter R. Conroy. Initially run by the Sisters of Notre Dame de Namur, the school served children in First through Fifth grades and within three years added a Middle School. In 1989 a full day Kindergarten program was born and in 2000 a Preschool program was introduced. Dedicated to academic excellence, stellar service and living the Gospel values, St. Rose of Lima School has been a second home to thousands of students who have walked these halls for sixty years and continue to thrive. While the original school building still stands strong, there was a need to expand to accommodate the growing student population and changing needs of an increasingly technology focused education system. In 2008, under the guidance of Monsignor Robert Weiss, a beautiful addition, including a state of the art science lab and modern gymnasium/gathering hall, were unveiled and have become an integral part of the school’s daily and extracurricular learning activities. This building also serves the St. Rose parish community housing its vibrant CCD program and variety of church related events through the year. Recognized by the U.S. Department of Education as a Blue Ribbon School of Excellence and accredited by the New England Association of Schools and Colleges (NEASC), St. Rose School offers a competitive, nurturing and dimensional education to students in Preschool through 8th grade. Mandarin and Spanish are taught from age 3 through age 14. Enrichment programs such as Mock Trial, Advanced Math, Musical Theater, Instrument instruction, Basketball, Track, Cheer and Mandarin offer enhanced learning opportunities that promote well rounded and knowledgeable young men and women who develop the skills and confidence they need to take the next step in to high school and beyond. Through the years, St. Rose School has been identified by different logos and mottos. The latest logo, Rooted in Faith, Thriving in Academics, captures the essence of our beloved school and all of the people upon which it has been built and will continue to thrive. Indeed we have a rich history and bright future. Vive St. Rose School! Interested in learning more or taking a tour? Contact admissions, 203.426-5102 ext. 13 or email admissions@srles.com.